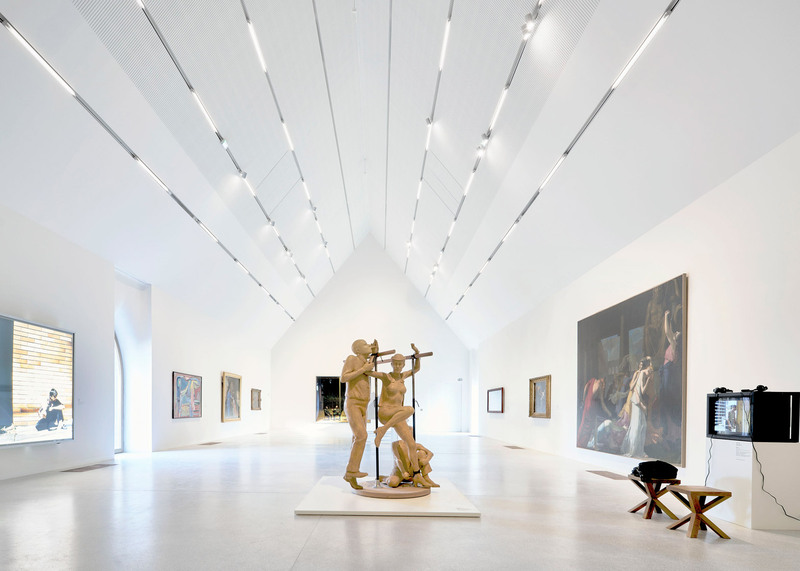 Herzog & de Meuron has completed an extension to the Musée Unterlinden in Colmar, France, creating a new underground gallery accessed via a monumental cast-concrete staircase (+ slideshow). 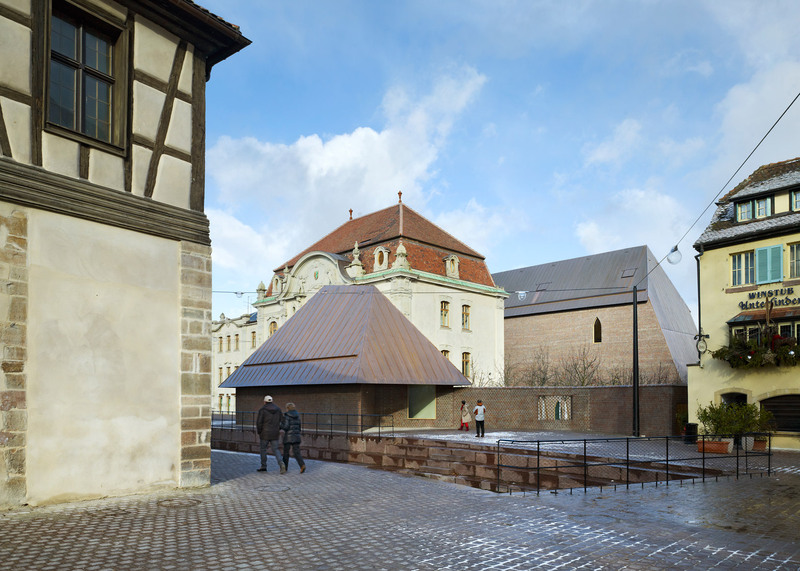 The Swiss firm has added nearly 2,000 square metres of floor space to the museum, which occupies a cluster of historical buildings including a 13th century convent and an early-20th-century bathhouse. Much of the extension is buried underground, but there are also two new brick buildings. 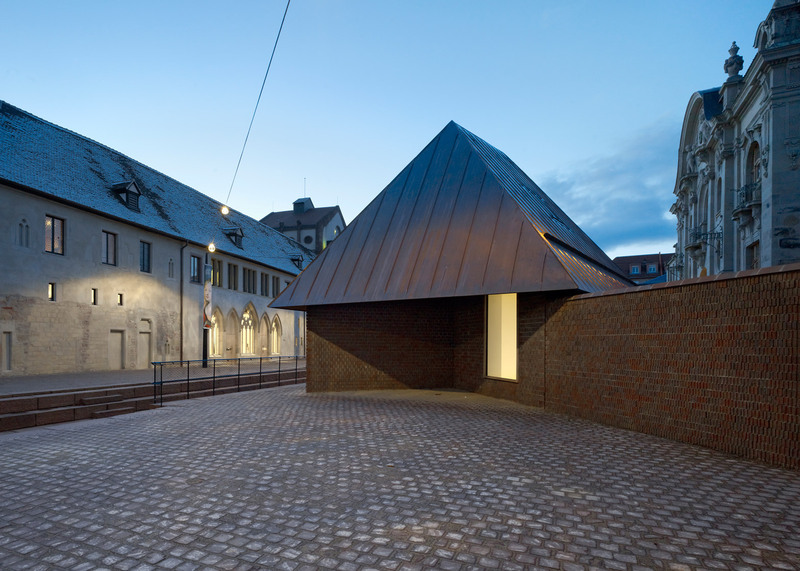 The first is a new gallery building, known as the Ackerhof, featuring an 11-metre-high exhibition space above ground. 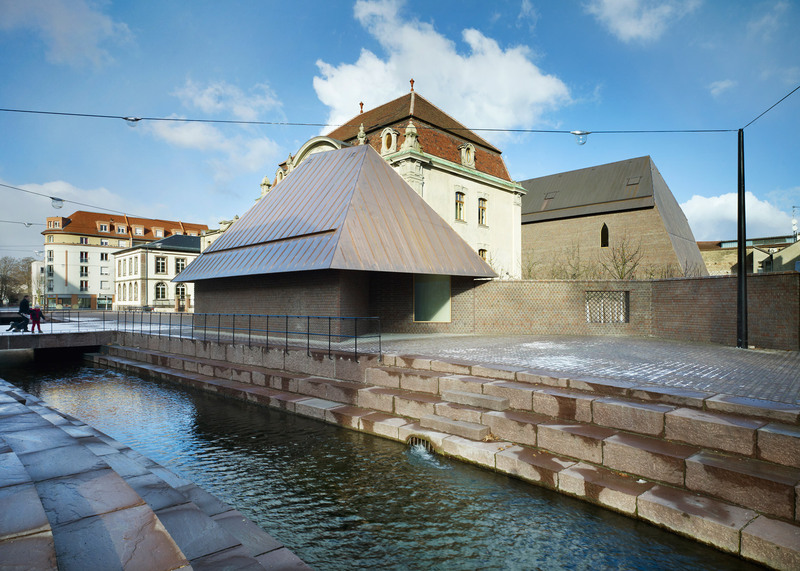 The second is a small house-like structure giving the museum a presence on the public square at the site's centre – a formerly underused space that straddles a newly uncovered canal. "The interplay between city planning, architecture and museography renders the Unterlinden project most exceptional: one leads to the other," said studio co-founder Jacques Herzog. 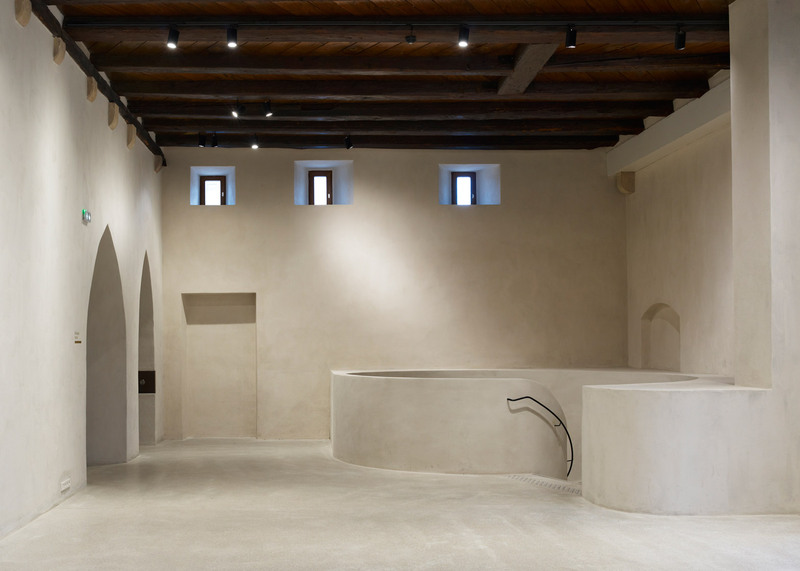 "From the angle of urban development, the most decisive contribution is the enhancement of the formerly desolate zone between the cloister and the former public baths," he said. 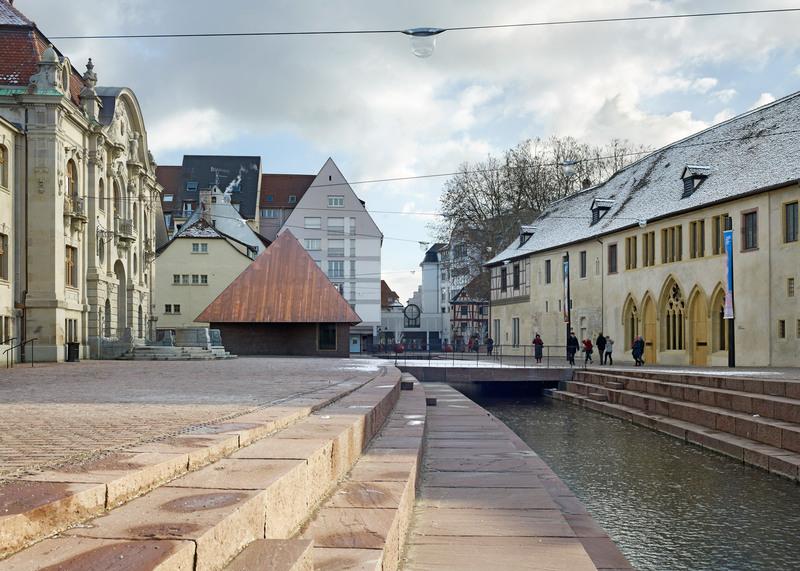 "The opening of the formerly covered canal provides an attractive site for Colmar: it is here that the entrance to the new museum complex has been transferred." 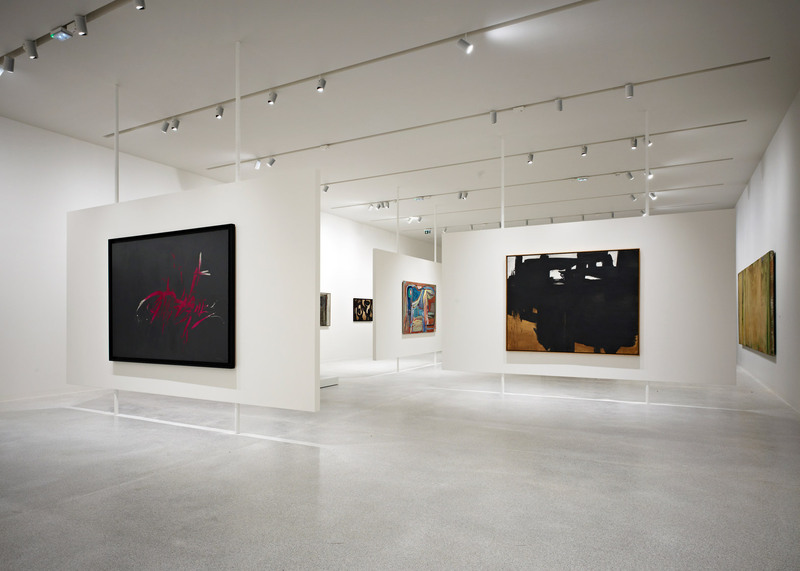 The new subterranean gallery is 58 metres long, and links the buildings on opposite sides of the square. 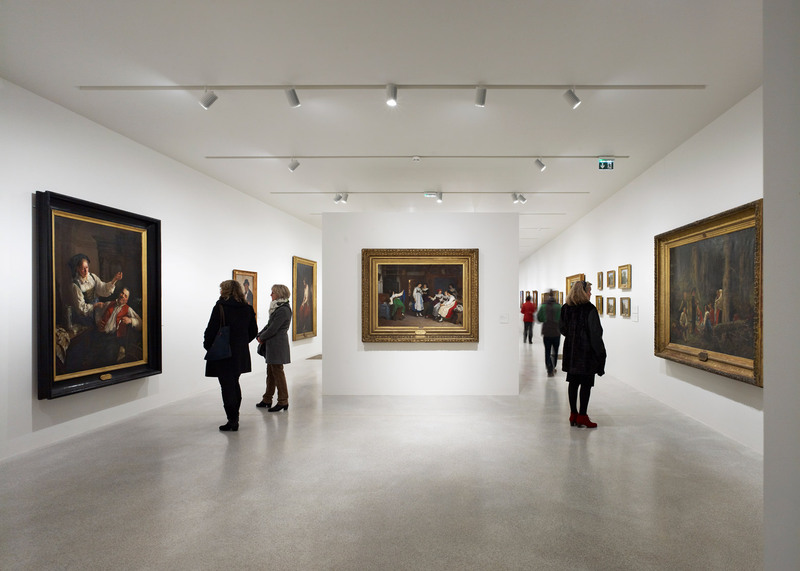 Visitors enter through the convent, which was restored in collaboration with the French national heritage department. The spiralling cast-concrete staircase leads downstairs, marking the gateway between old and new. The small house-like structure sits directly above the underground gallery, approximately halfway along. 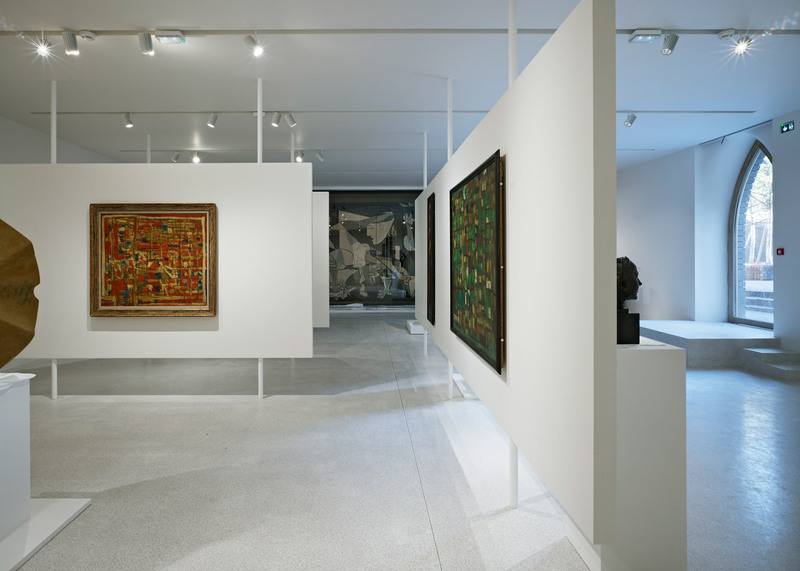 It houses works by artists including Claude Monet and Georges Rouault. Designed to resemble a mill that once stood on the site, the building has a pointed copper roof. There are also two large windows, offering views down into the gallery for passersby. "Visitors will experience the expanded Unterlinden Museum as an organic, complex sequence of inside and outside spaces," explained Christine Binswanger, a senior partner at Herzog & de Meuron. Both the Ackerhof and the small house-like block were built using irregular hand-broken bricks, intended to complement the stone and plaster facade of the convent building. The Ackerhof also features lancet windows – a type of slender opening with a pointed arch on top, typical of Gothic churches. "In our profession, only rarely do we have the occasion to custom tailor architecture to such a degree, to a content that spans several centuries," added Binswanger. "We had a chance to simultaneously, and equally intensively, address changes to the urban fabric as well as the presentation of a single work of art." 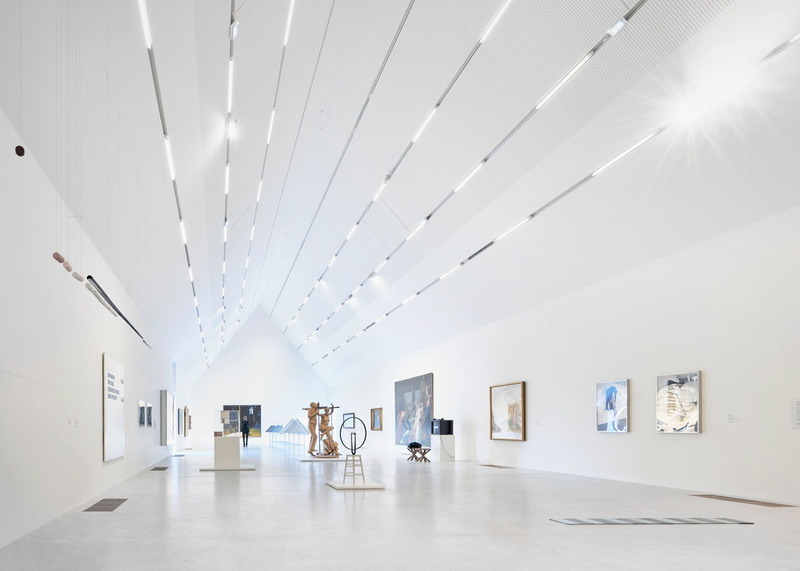 Herzog & de Meuron now has several art gallery projects in its portfolio. These include the Tate Modern gallery in London, the Pérez Art Museum in Miami and the Parrish Art Museum in Long Island, New York. The Musée Unterlinden is best known for housing the Isenheim Altarpiece, a sculpted piece painted by German artist Matthias Grünewald in the 16th century. 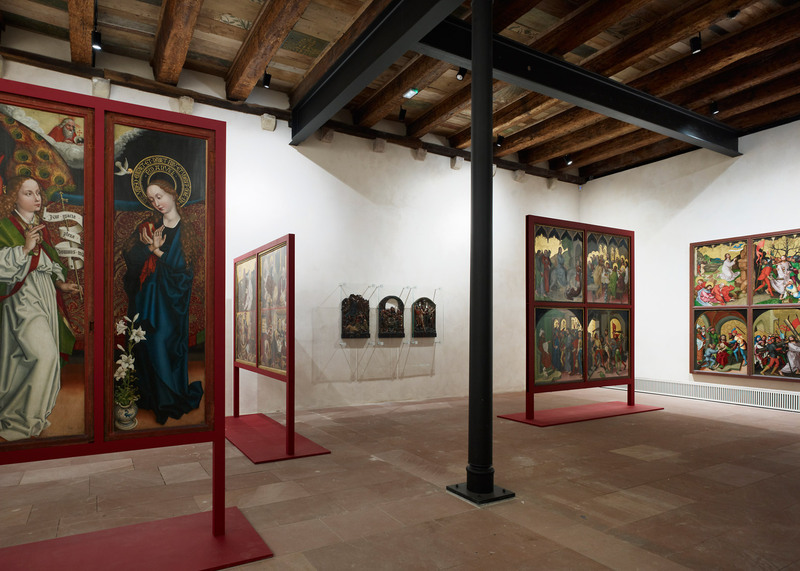 This work is located in the convent's chapel, alongside other historical works. 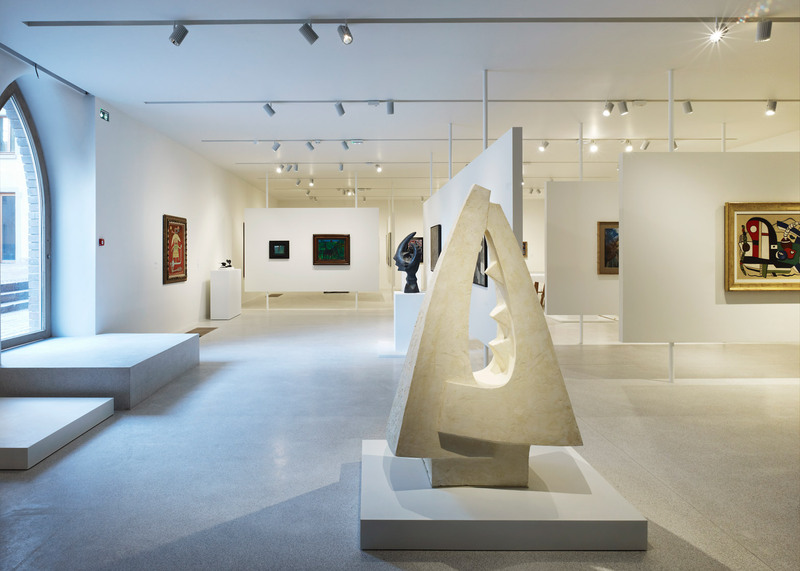 The Ackerhof hosts temporary exhibitions, while the underground spaces are used to exhibit the museum's history, as well as 19th and 20th century artworks. 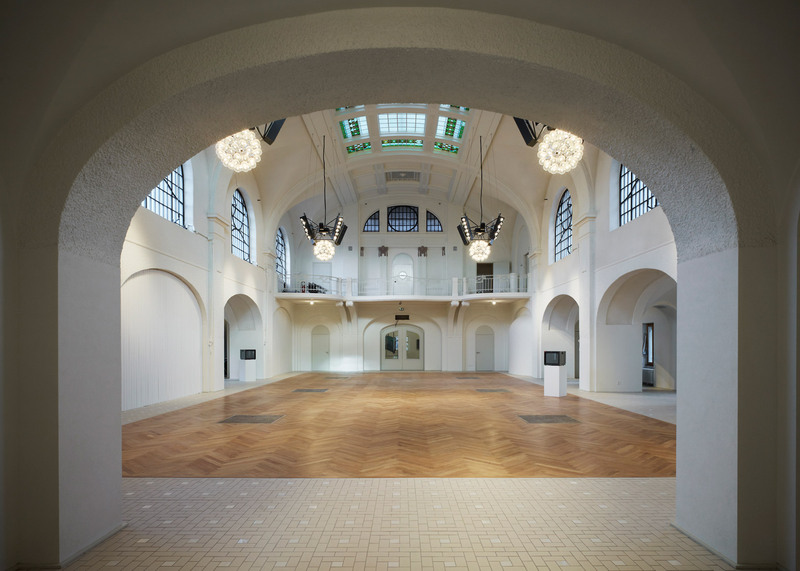 The former bathhouse functions as a venue for events and installations, and also contains a library and cafe. Photography is by Ruedi Walti.